Carly Carlson Photography | BLOG | Baker City Eastern Oregon Senior & Wedding Photographer: Happy October! Contest is open to anyone living in or around Idaho Falls, as sessions will take place in I.F. Be sure to leave your comment here so I know you are participating! Leave a link to your blog if you want! 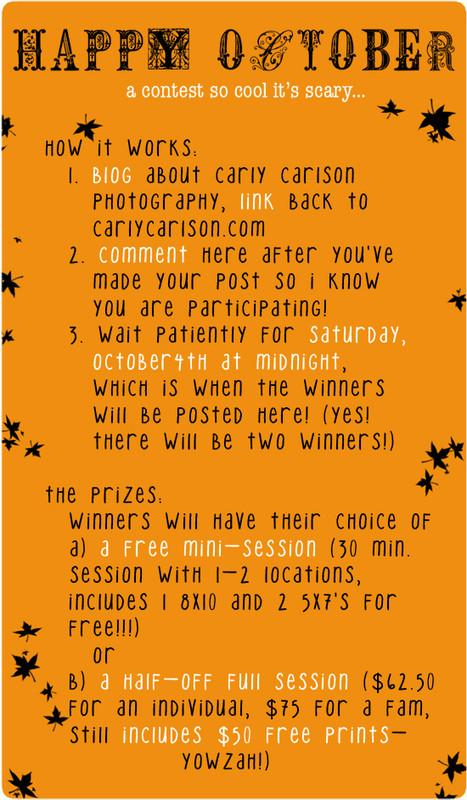 :) Winners will be chosen randomly, and entries must be made by Saturday at 11:55 pm to be entered. I got my WAY CUTE fonts at kevinandamanda.com Check them out! I love the fall too, maybe partly because my birthday is in October. Does it matter that we participate and our blog is private? Carly you are an amazing photographer. Berret and I should schedule a session with you anyways...my belly keeps getting bigger and bigger! If not to document the belly then for sure when the baby comes. well that's good, I made a blog with a link and I've had you on my link list too for a while. Hey Carly! You are really the best ever. Everything I wrote about you on our blog is TRUE! And just wondering - did you want me to keep your pictures on our blog or take them off? I noticed a note you have on this blog. I'm SO sorry if they're not supposed to be there! Just let me know. Have a great conference weekend! Carly, I love your blog! Everything is beautiful! I might have to have a session with you for our family! I love your pics, Carly. I blogged about it and hopefully you'll get some new customers!